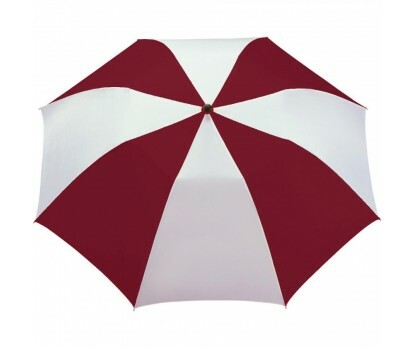 Promotional burgundy & white 42” arc printed umbrellas spell success for many low budget marketers who never want to take chance with their first marketing investments. This umbrella is appreciated by one and all due to its powerful visual representation and it possesses a universal appeal. Personalized burgundy& white 42” arc printed umbrellas make a great gifting choice for fashion houses, cosmetic companies, and services that are targeting women. Custom burgundy & white 42” arc printed umbrella can grab attention from any crowd. Features- ergonomic matte black plastic handle with wrist wrap, pongee canopy (burgundy and white) with matching color case, and 2 sections folding metal shaft. Dimensions – 42” arc closes to 15”. Imprint area - 6" H x 6" W.